We spent a lovely six days on the island of Sao Miguel. 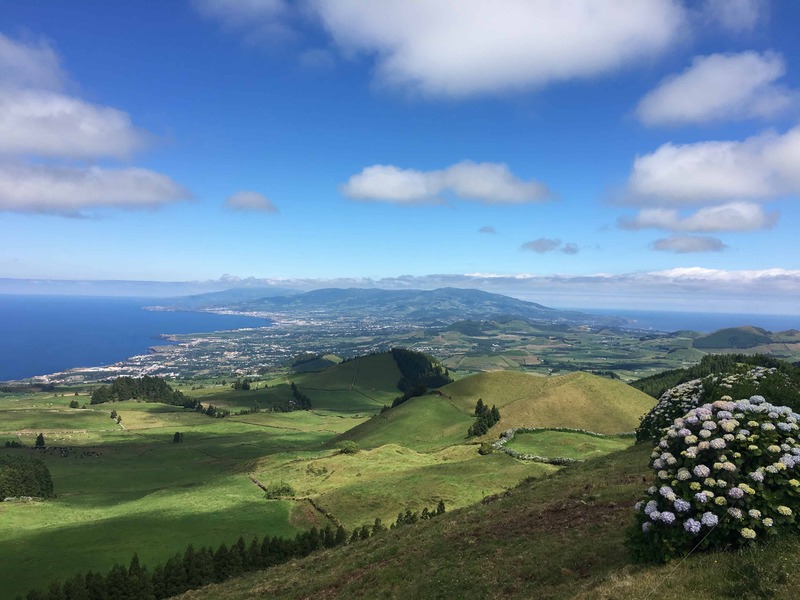 Sao Miguel is the largest of Portugal’s Azores, an archipelago in the middle of the Atlantic ocean between Europe and the US. We boarded a completely full economy flight out of Lisbon. Luckily, the flight was just over two hours so it was bearable. When we landed it was dark and all you could see below were a few twinkling lights. It’s a bit magical to land in a new place at night, when sight is dimmed and you have to rely on your other senses. There’s this feeling that you could be anywhere in the world. The night we landed, the air was cool and there was a light fog. We’d heard stories from friends who had been there…of cows roaming the rolling hillsides, of how the hydrangeas grow wild like weeds dotting the countryside and lining the roads in a riot of pastel hues, of how the island is small enough that there are viewpoints from which one can see the Atlantic encircling the island from all directions, stretching outward in dazzling blues…but hearing stories and seeing with one’s own eyes are entirely different. We’d have to wait until morning to see for ourselves. If there is a heaven, someone cut a slice out and dropped it in the middle of the Atlantic. 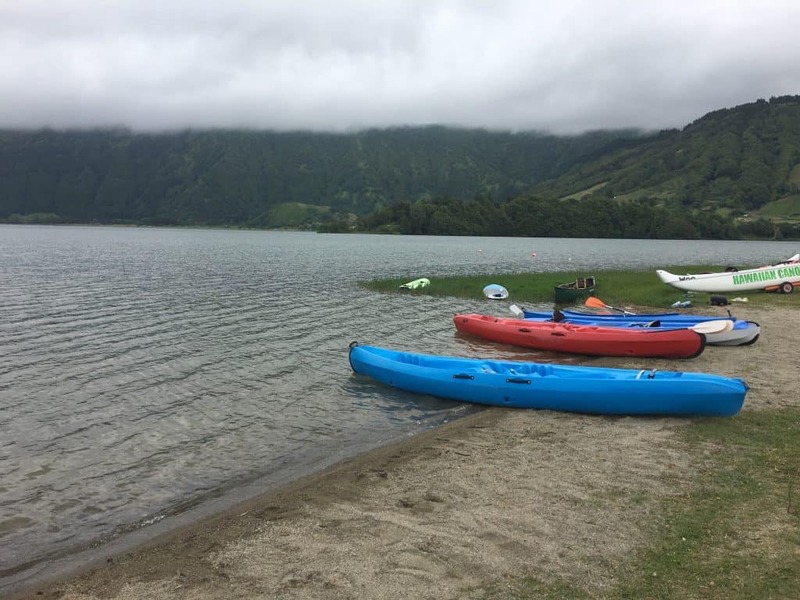 There are still relatively few tourists on the Azores. And I find myself hesitating to even write about them and share this as it is on it’s way to becoming more discovered every year. And we could see why. It’s as if Hawaii and Europe have combined and made a less inhabited vacation getaway, where the hours pass by slowly, and where you can sit and watch the earth breath….literally! 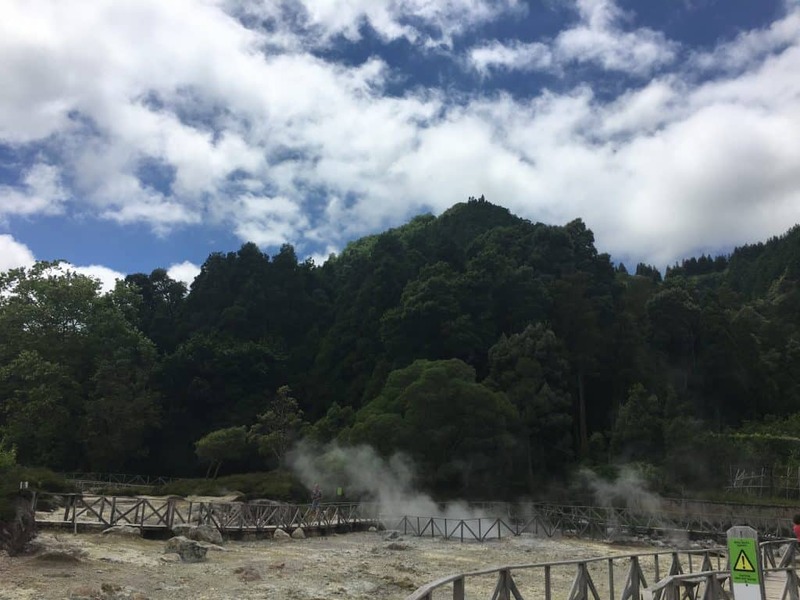 There’s an active volcano on the island and many hot springs dot the land inviting one to sit, relax, and take in what many believe are the healing benefits of this special water warmed from the earth. Sete Cidades is a town that sits on the Lagoa das Sete Cidades or “Lagoon of the Seven Cities”, a twin lake situated in the crater of a dormant volcano. 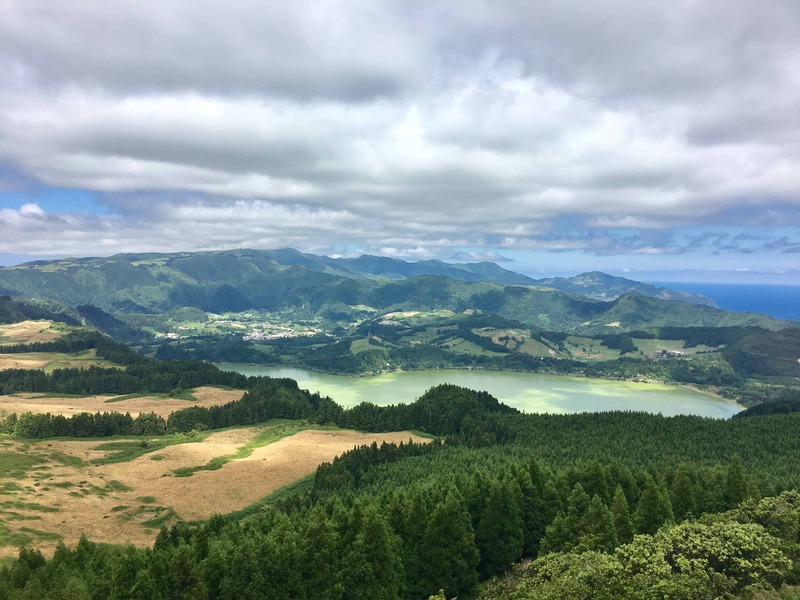 Along the road to Sete Cidades one encounters many stunning views. 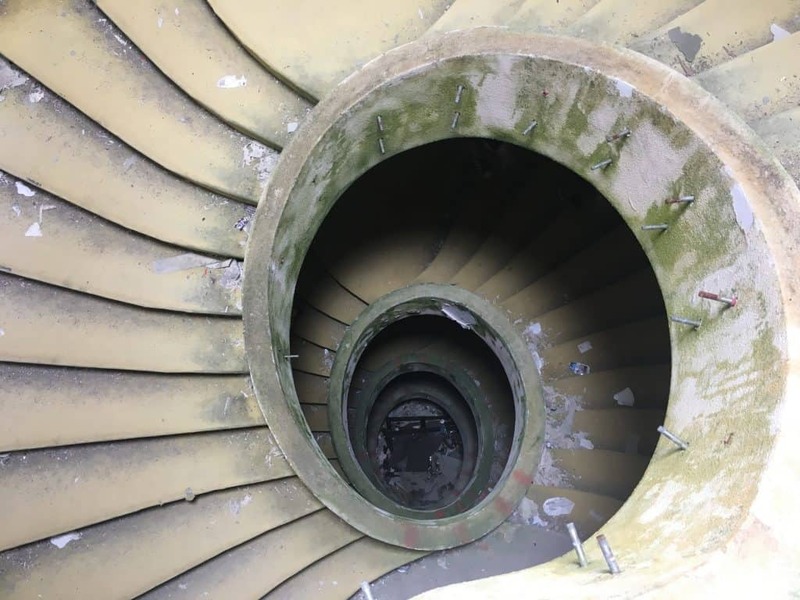 Apart from the views, another attraction has grabbed the attention of tourists young and old, an abandoned hotel known as The Monte Palace. Once heavily guarded against lookie-loos one can now walk right in through the front doors, or what used to be the front doors and wander the ghost-like structure of a time past. You can see my photos here, but for more, you can check out Rags to Couture. And, if you are intrigued, there is an excellent video online. The footage at the end of the video features before and after images that give you a taste of the haunted feeling one gets when visiting this abandoned place. 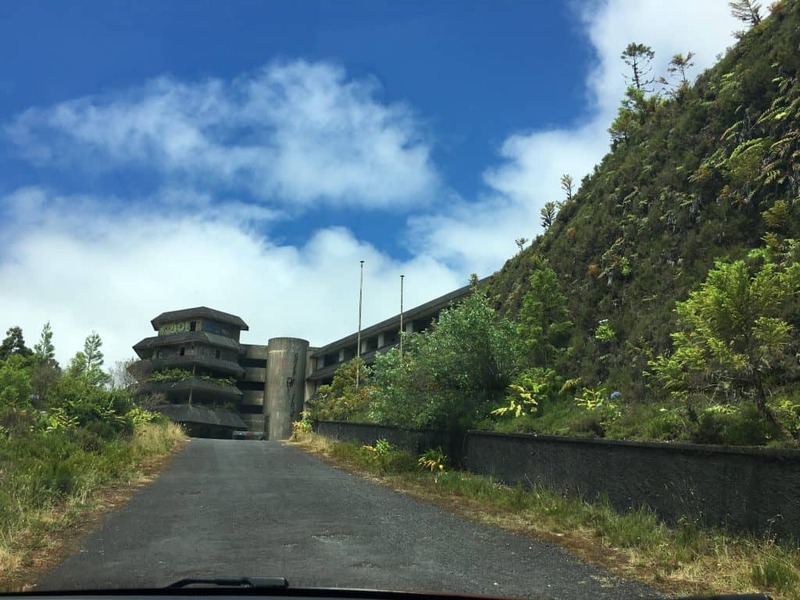 I highly recommend a stop off at The Monte Palace, it is one of those unique places that will stick with you long after you’ve gone home. 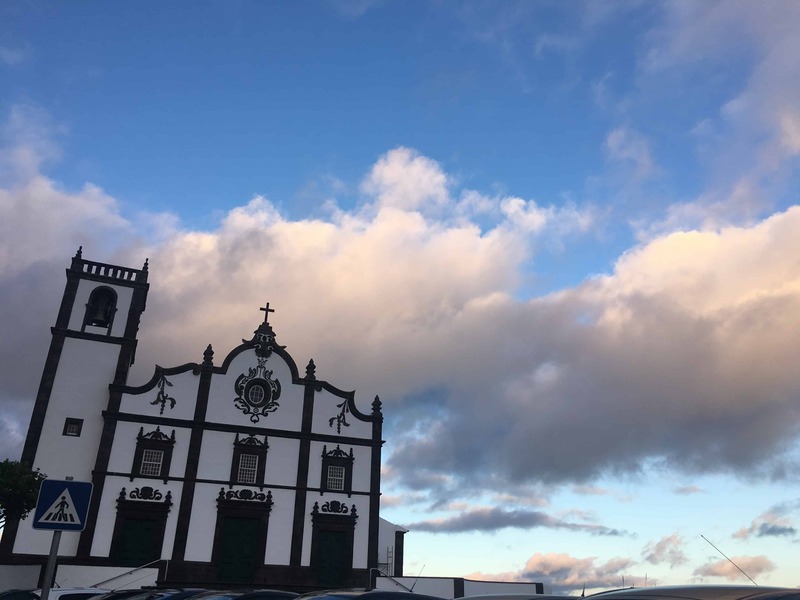 One more note here, after you leave the hotel, be sure to drive down into the town of Sete Cidades and stop at the Quinta da Queiro Cafe. It’s on your left as you drive into town. 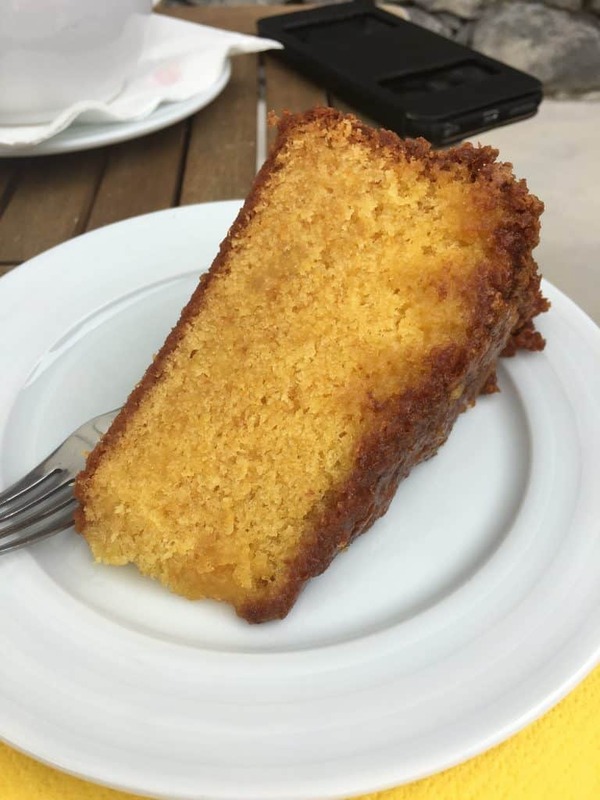 You’ll see a little sign hanging that says ‘tea shop’, head down the little drive and be prepared for the BEST Orange Cake you’ve ever had. And (at the time we were there) it was only a euro per slice! For something savory, they had fabulous salads and soups. It’s the perfect, pretty spot for a snack or lunch. They also rent houses for overnight stays. For more information please see their website. Friends who had visited Sao Miguel said that while the scenery would knock our socks off, the food was bad -really bad. So, before we went I did my research. And after reading reviews, we were lucky to find a tiny mercantile/restaurant called Mercearia São Pedro Wine & Tapas. 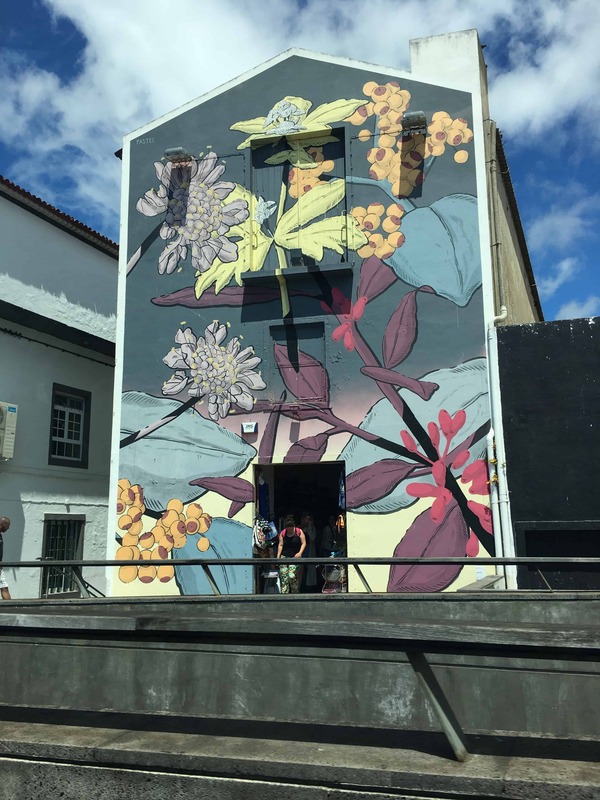 It’s located in Ponta Delgada a few blocks off of the marginal (seaside road). It’s not a full-service restaurant per se, but they have a nice selection of tapes and wines. Also, while there you can pick up some local foods and we did see several locals pop in to buy their daily bread and wine. We even bought some milk to take back to the hotel room for our coffee in the morning. 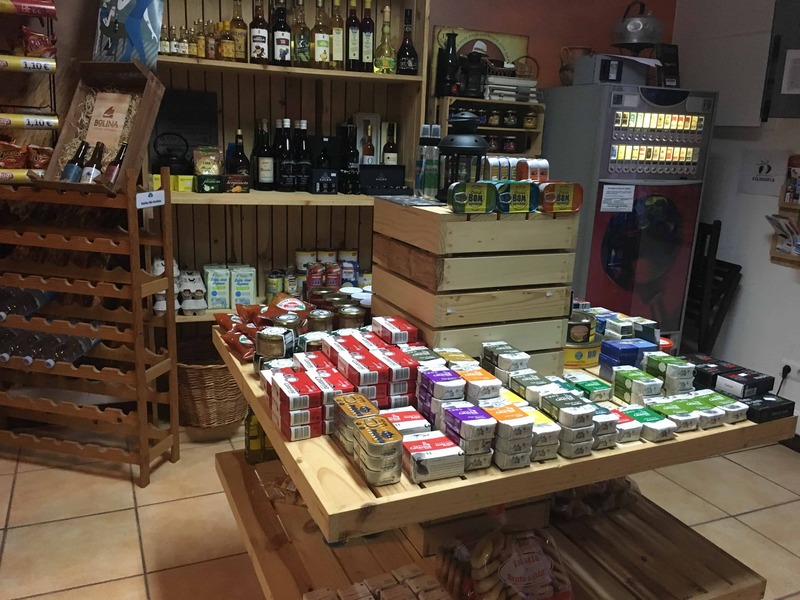 They offer a variety of products from the Azores such as cheeses, regional meats, jams and honey, and regional crafts. The owner, Marcio Silva, greeted us with a smile and as the place wasn’t very busy while we were there we had the pleasure of talking with him a bit. The atmosphere is laid back and there are only four tables. 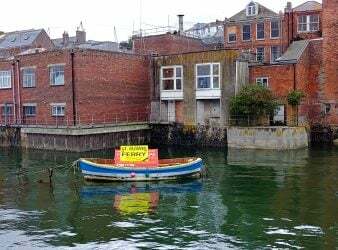 He said his objective is to provide a space for tourists and locals to just sit and relax and enjoy a drink and/or a light snack and converse. He want’s to maintain the sense of community coming together and spending time with one another. Marcio started us off with a wine from another island in the Azores. It was from the island of Pico. And it’s label simply read Viho de Mesa Tinto Produzido e engarrafado por: Marcio Silva… which means Red Table Wine, produced and bottled for Marcio Silva. I.e. it’s not available for sale outside of the cute little barrel he was pouring it from. You’ll just have to go and ask him for a glass of his Viho de Mesa Tinto from Pico. It tasted like Smarties candies! At first, I thought it was odd, but as soon as I placed the flavor I decided I loved it! For our twelve-year-old son, he brought out a traditional drink called Kima, which is a passion fruit soda. It’s very sweet. 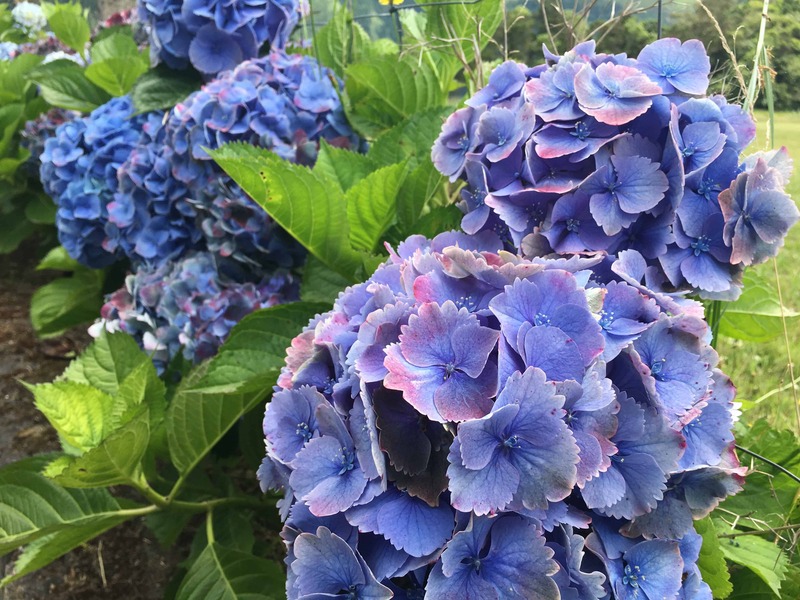 In fact, I found it too sweet. But my husband loved them and happily drank several while we were on Sao Miguel. For our tapas, we started with tuna in an oil and light tomato marinade which was really good! We were told it is a local favorite. We also had pork and beef tapenade which Marcio told us is a very traditional dish and, to our delight, he served it with our favorite bread, Bolo Lêvedo. A friend of ours had mentioned the bread before our trip and said that after five years she still dreams of it! And we could see why! It’s a slightly sweet bread and the reason it was familiar didn’t hit us until we were home. My mother in law pointed out that the bread was familiar was because we’d spent so much time in Hawaii. The Portuguese went to Hawaii from the Azores in the late 1800s to work on the sugar plantations and brought what we call “Hawaiian sweet bread or rolls” with them! Ah-ha! That’s why it was familiar. When we lived in the states we discovered it was the best bread for hamburgers and sloppy joes! The Bolo Lêvedo we found on Sao Miguel is a slightly different version as it’s in the shape of an english muffin, but the flavor is similar. For an interesting read on the migration of Portuguese and their wonderful bread to Hawaii check out this article I found. On to the cheese board—it was fabulous! 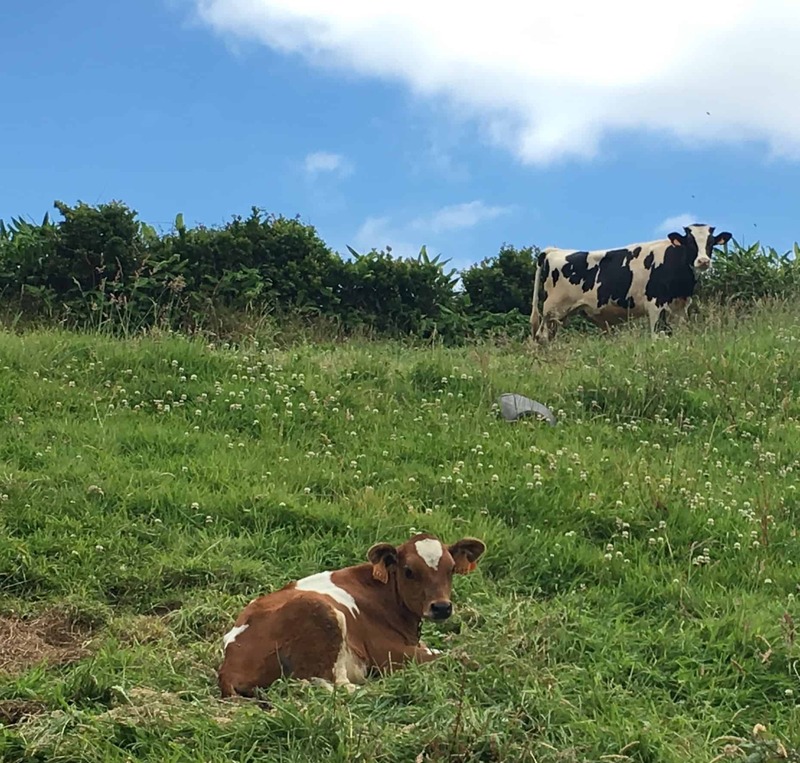 With the amount of cows one sees dotting the hillsides, it’s no surprise that this area is known for its dairy products. All of the cheeses on the board were from the Azores and my favorite was from the island of Faial. It was soft, mild and nutty and went perfectly with the smoked meats. Marcio also brought out a plate of the popular blood sausage. 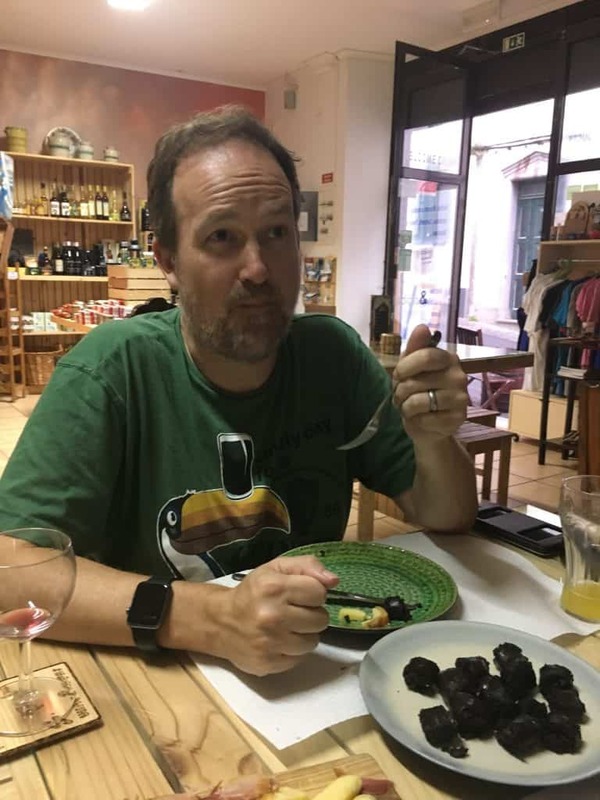 My husband told him he really didn’t like blood sausage and I told him there’d be no way I’d be eating it, but Marcio said it was really good and that my husband should give it a try. So, my husband agreed and said, ‘but only a bite!” LOL. Marcio brought out a plate full! And though I felt bad for my husband I must admit I did snicker a little. He and our son were both brave and tried it. They said it was very good—as far as blood sausage can be good. Our son said it tasted like beef jerky, which he loves…but I did notice neither of them took a second bite! You can find more information on Marcio restaurant on their Facebook page. Another memorable dinner in Ponta Delgado was at the Taberna Acor. We had read reviews ahead of our arrival on the island and I inquired about eating there for our story based on the tremendous things people had to say about the place. We were greeted by the owner Pedro Raposo, a friendly local with a big mop of dark curls and an infectious smile. When I commented on how busy they were, he said that yes, they were very busy all the time…though perhaps a bit quieter during the offseason. We were there in July, so there were lots of tourists (for Azores standards) around. The reviews were spot on. We had a marvelous meal, served up by a friendly wait staff in a cozy room. We asked for their recommendations along the way and we were not disappointed! 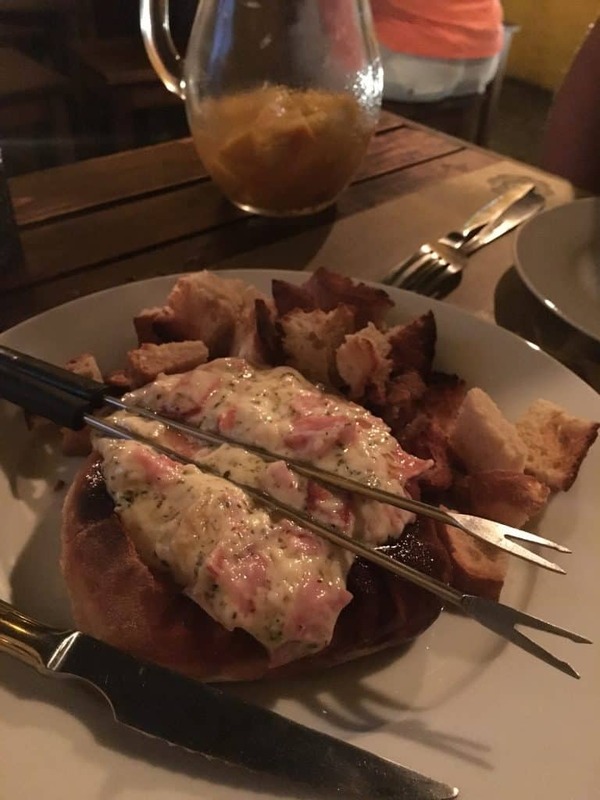 We started with fondue served in a bread bowl. It was San George cheese which is an older cheese, mixed with younger cheeses from two other islands and a whole mess of herbs and ham. Wow! I cannot put into words how much my husband and I enjoyed this dish. It is not your typical fondue, which they warned us about ahead of time. It’s their take on it and we give it two thumbs up! We also indulged in the dates wrapped in bacon, which our son liked so much that I ended up with only one! 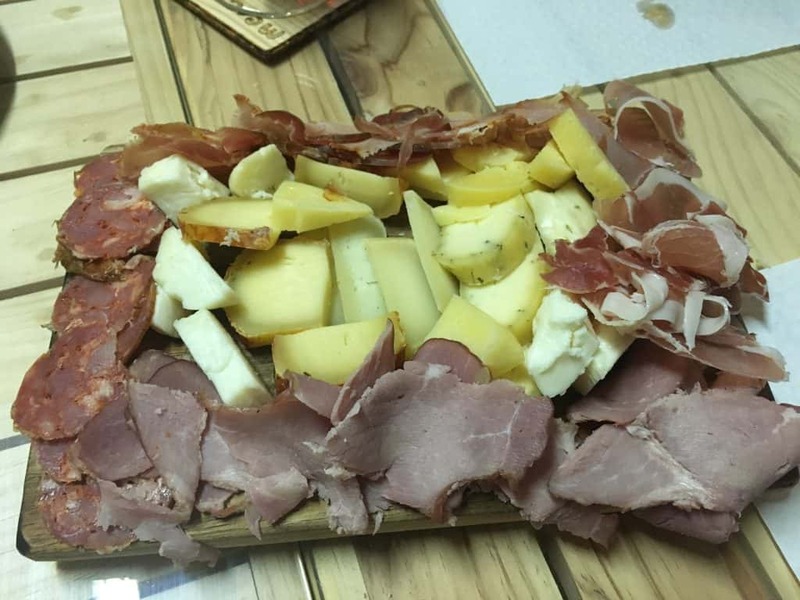 For our main course, we shared a traditional meat and cheese board, the Tabua “Endhidos” (I did try to look up what this means in English, but apparently it means the same thing!). It is described as three different island cheeses, three different smoked meats, pe de torresmo (“foot of crackling”—smoked ham), and was accompanied by pineapple, melon, regional jam, honey, butter, olives, homemade bread and “Massa Sovada” (which according to google translate means “Massa Sovada”, so yeah no idea). The food was fabulous! The cheeses were all great! I mean, really, every one of them! I’m not a fan of stinky cheese and we didn’t run into any in the Azores. I’m not saying they don’t exist, but in our experience, they didn’t and I was glad! Also, the meats were great though we are not fans of blood sausage, so we skipped that part…luckily that was only a small part of it. As for dessert, our food server suggested the pineapple with ice cream. Normally, I probably wouldn’t gravitate to that choice, but whoah! 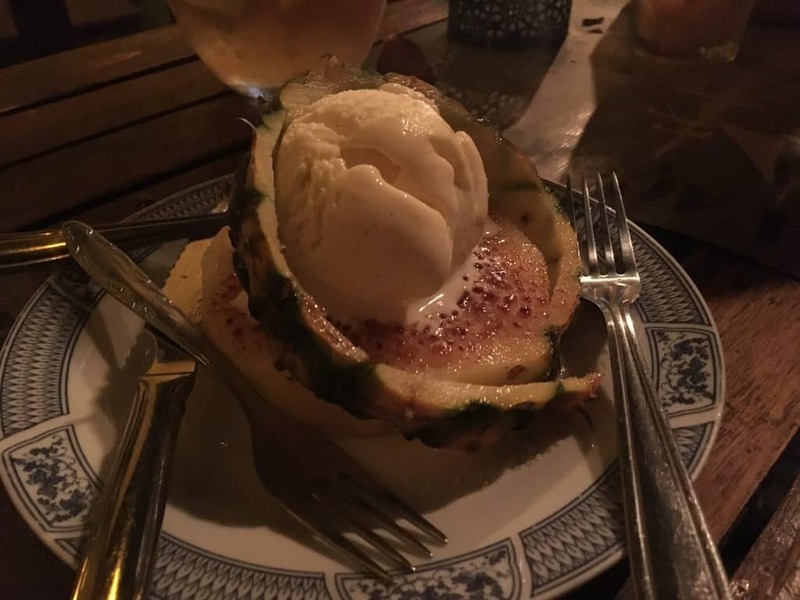 The pineapple had been prepared in the same manner as cream brûlée (i.e. sugar sprinkled on top then hit with a blow torch) so it had that nice crunch on top and as all Azorian dairy, the ice cream was perfectly creamy—one of my favorite parts of the meal! We paired the food with a white sangria that was to die for! It was sweet, but not too sweet and extremely refreshing—quite possibly the best white sangria I’ve ever had. 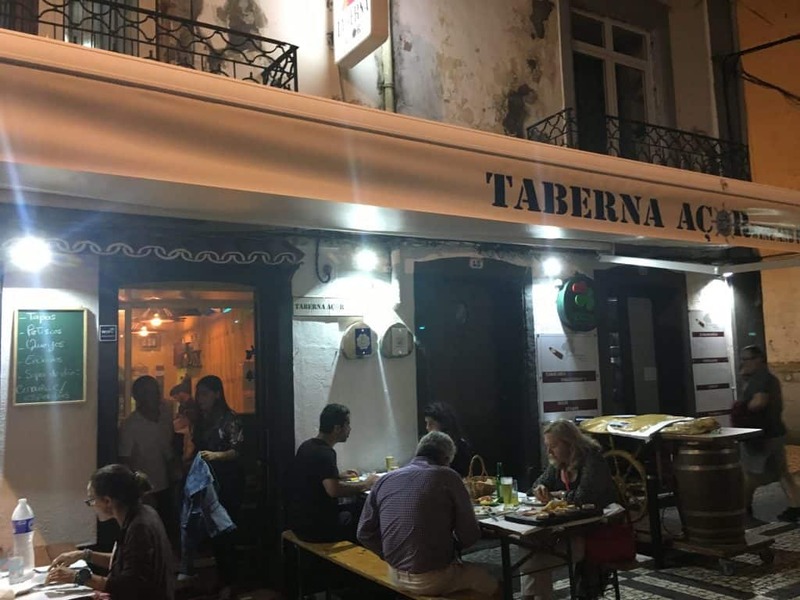 When you visit Sao Miguel, make sure to stop at the Taberna Acor for a meal. And say hello to Pedro for us! He may be behind the bar as that is where he spent quite a bit of time working while we were there. I can’t believe they’ve only been open for two years as they seem to have the art of running a busy restaurant down to a science and you could see in his eyes and the smile lines of his face that he loves what he does! You can find more info on their Facebook page. So, after the first two dinners, we found that our friends who had said the food was terrible back when they visited Sao Miguel, were wrong! Or at least, that’s not the case these days. Now, I love Mexican food. 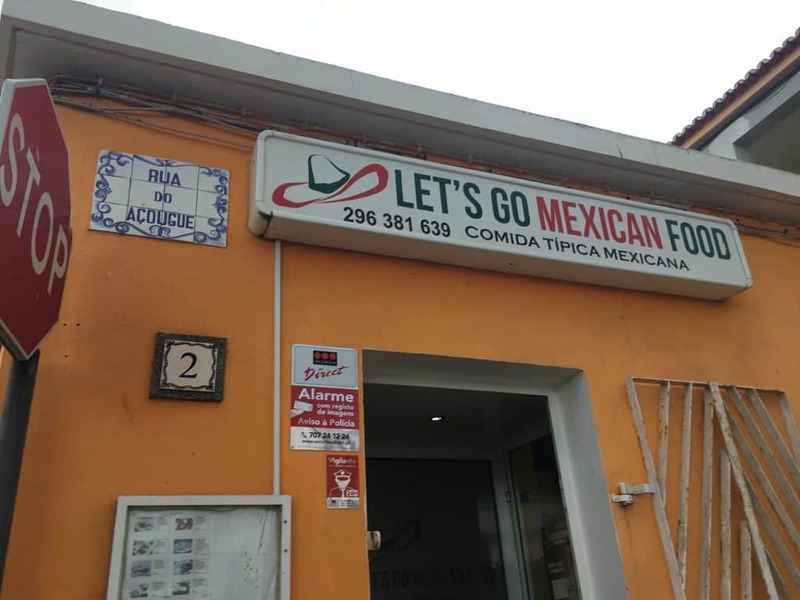 I grew up in Southern California where great Mexican food is easy to find and now that we live in Portugal, well let’s just say it’s not so easy to find! So, when we travel I always look for a Mexican restaurant. We’ve had great Mexican food in Amsterdam, Barcelona and even Munich! And after our visit to Let’s Go Mexican Food in Ponta Delgado, I can say we’ve had great Mexican food in Portugal! 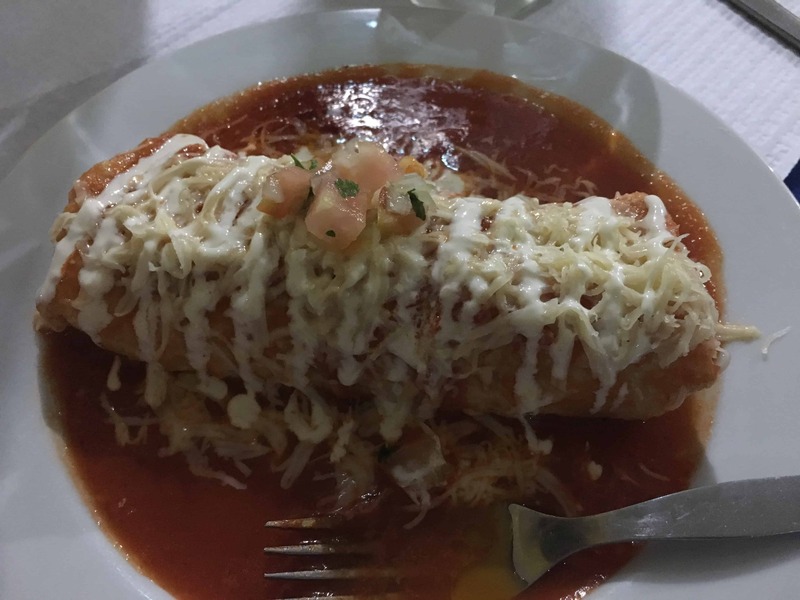 We had their homemade chips and guacamole, their burrito molhado (what I call a burrito, enchilada style…i.e. a burrito covered in sauce and melted cheese), my husband had the tacos and our son had the quesadilla. We also had a pitcher of margaritas to top it off. The entire meal was fabulous and the owner was extremely friendly. If you’re ready for some Mexican food, check them out! They don’t have a website, but they do have a Facebook page. 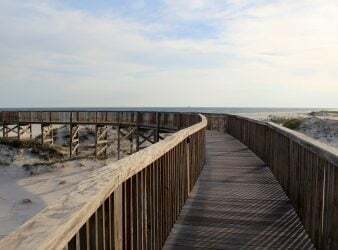 There are many fabulous walks on the island as well. Our favorite viewpoint was from Miradouro da Boca do Inferno. 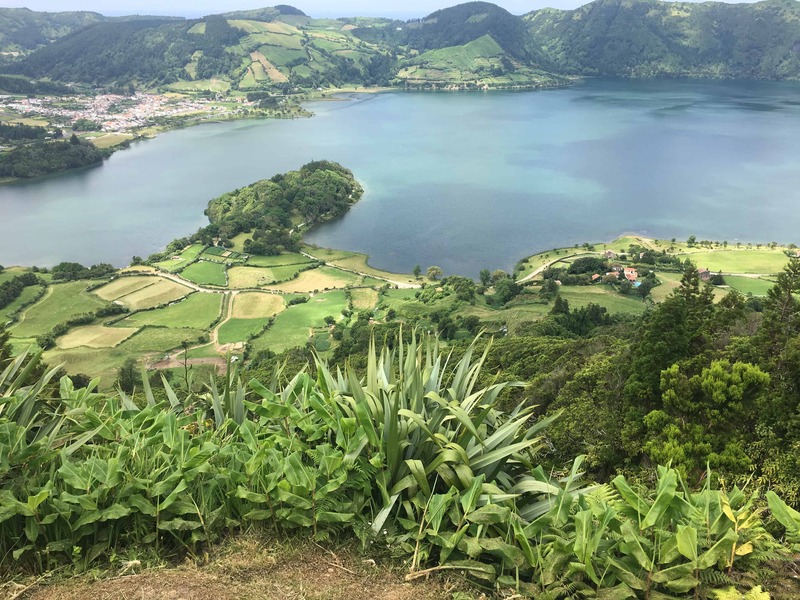 There is a short trail up to a fantastic view of the two lakes of Sete Cidades. There were quite a few people there as it is a very popular spot. So, my advice would be to go early in the morning. With luck, you’ll be there on a day that is clear and be treated to this…. At the other end of the island is the town of Furnas. This is where the hot springs are located. The town itself is lovely. A very nice shade of green invades your senses as you look around the hills rising up around you. This area gets a lot of mist and rain, and the foliage echoes that. It’s just beautiful. You can take a stroll at the Terra Nostra Gardens, or go for a dip in the thermal pools of Poca Da Dona Beija for a mere four euros. We really enjoyed wandering around Caldeiras da Lagoa das Furnas. You can walk a path through the steam vents and see them cooking couzidas, a stew they cook underground and then serve at the local hotels and restaurants. 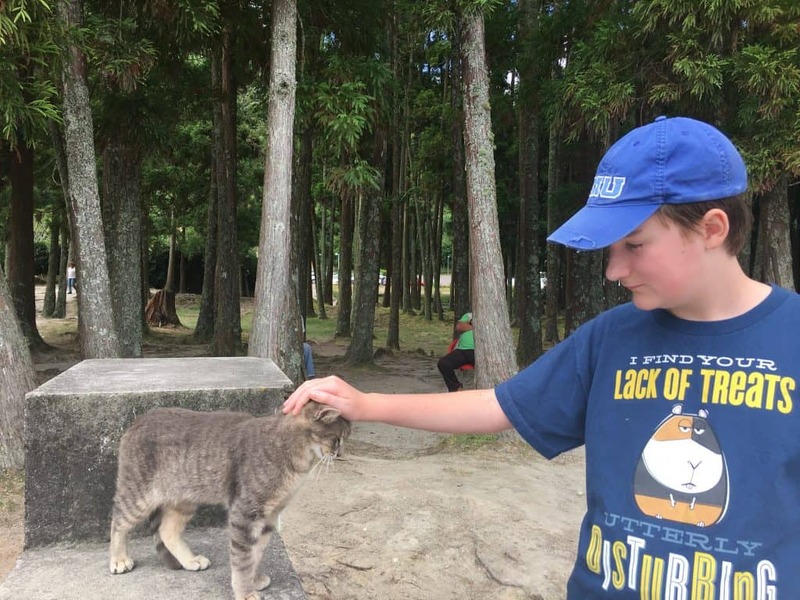 Our son really enjoyed all the cats and ducks and there’s a small kiosk where one can buy food to feed them. 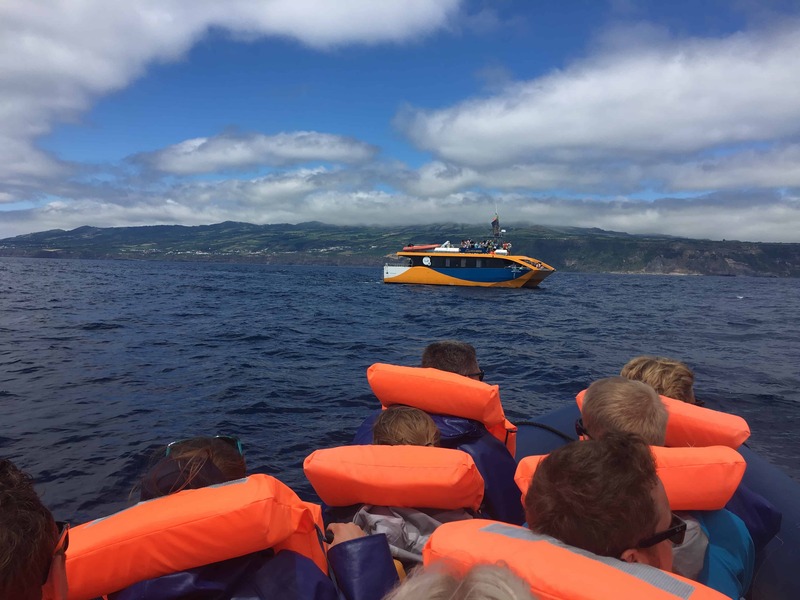 We had the pleasure of going on a dolphin and whale watching boat trip out of Ponta Delgado with Picos de Aventura company. And, although we were not lucky enough to see any whales we had a fantastic time aboard one of their zodiac boats. We were privileged to see and spend time with several species of dolphins and were surrounded by these beautiful creatures as they came up to inspect and play around our boat. I highly recommend a trip with Picos de Aventura. 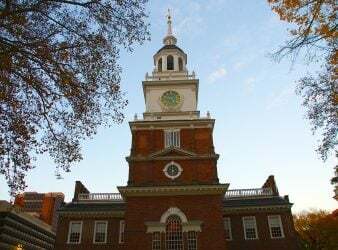 You can find information on all the activities they offer on their website. 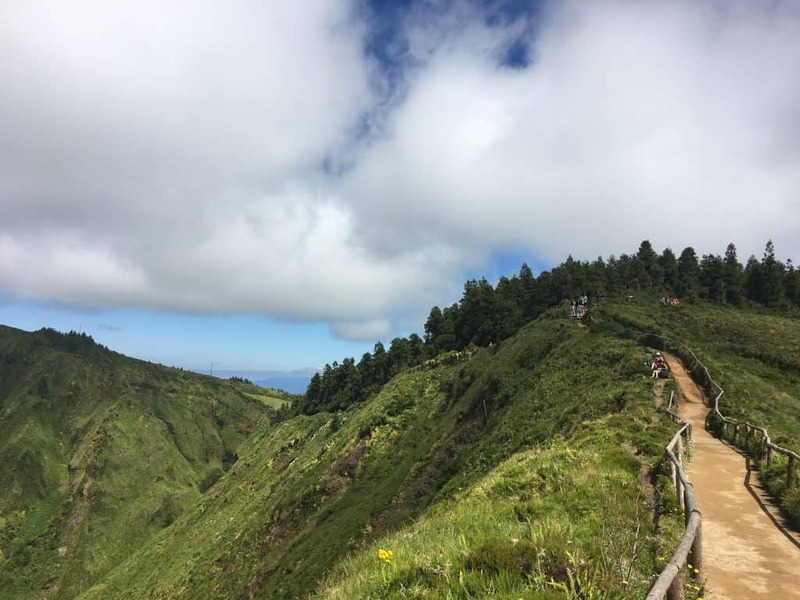 If your heart is aching for some time away in a beautiful natural landscape, Sao Miguel is a great spot. As I mentioned earlier, the locals tell us that every year the tourism goes up. Unfortunately, this has happened to many wonderful places…but it’s a small world and there are lots of us, so we just have to share. If crowds bother you, try going in the off season, or the shoulder season. The weather might not be as nice, but it could afford you more solitude. 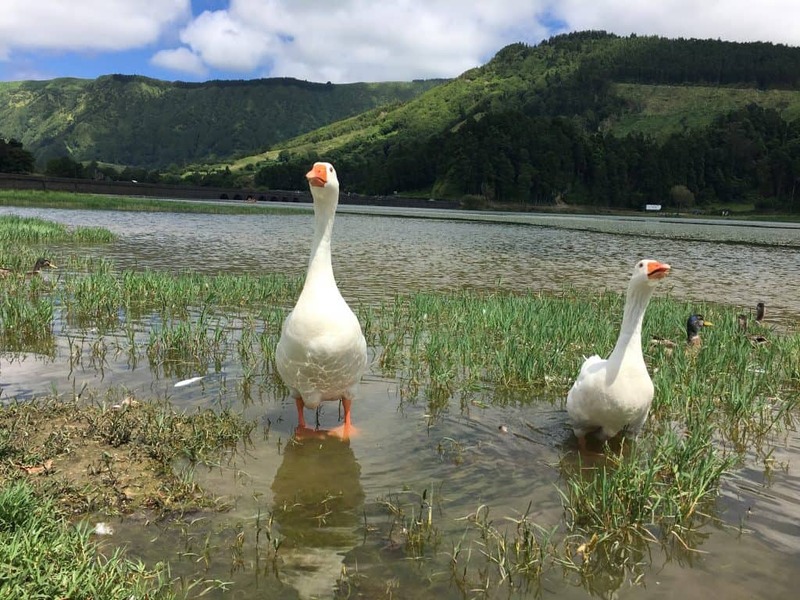 That being said, as far as tourist destinations go, the Azores are still relatively calm. 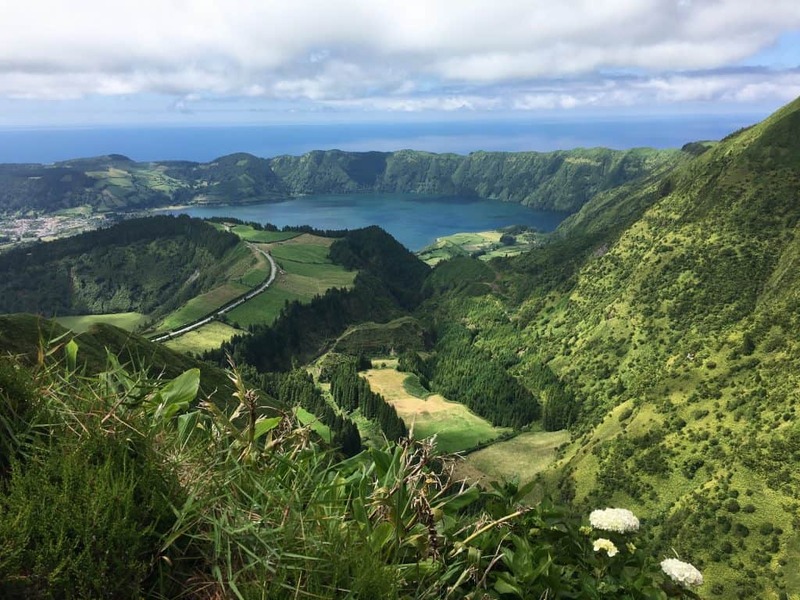 Also, Sao Miguel is just one of the islands. We look forward to exploring others and telling you about them. For now, I will leave you with a few photos. 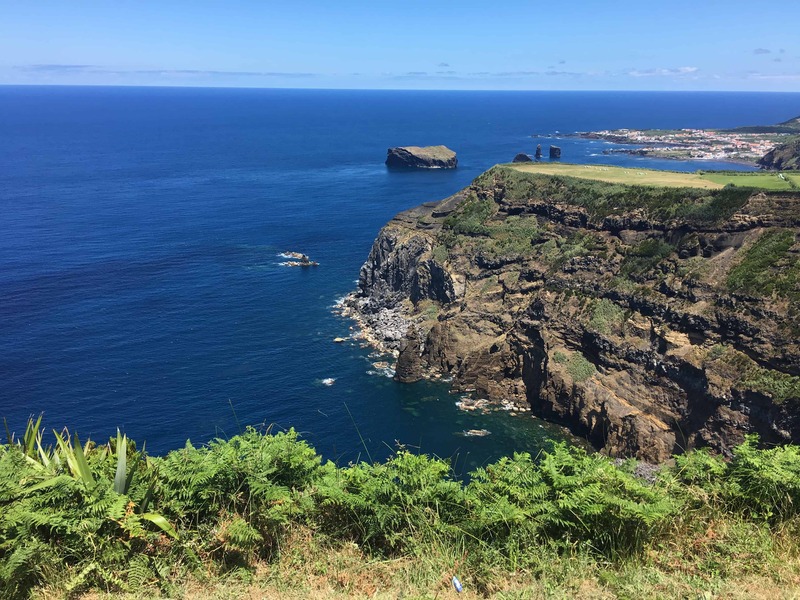 And if you have the chance to visit, the views of Sao Miguel will leave you breathless, the food will be a joy and the warm waters may just ease your aches and pains.